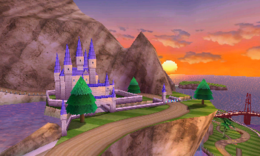 This article is about the second course based on Wuhu Island in Mario Kart 7. For other uses of "Wuhu", see Wuhu. Maka Wuhu (known as Wuhu Mountain Loop in the British English release) is the final race track in the Star Cup of Mario Kart 7, which takes place on Wuhu Island from Wii Sports Resort. 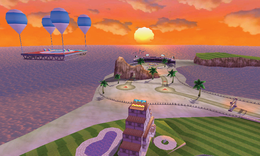 Like Wuhu Loop, the course's music is a remix of the title screen music of Wii Sports Resort. This is the second course to be a long track split into segments rather than laps. Unlike most other courses, Maka Wuhu has no laps, but a start and end point (which are in different areas, a trait specific to this track) and is divided in three sections, similar to its counterpart, Wuhu Loop, and this game's variant of Rainbow Road. The race starts at the base of the island near the bridge at sunset, and crosses the Wuhu Loop track. After some twists and turns, the track heads into the caves on the mountain. Upon emerging from the cave the track loops around the side of the mountain and pass the island's castle before continuing to ascend the mountain, dodging rolling boulders as they go. At the top of the mountain, players will then drive over a boost pad and glide down to the ocean and the finish line. Attempting to drive to the finish line from the start will result in them going to an out-of-bounds area and the player will be brought back to the starting line. The race begins on the beach of Maka Wuhu in the evening, where several trick ramps and dirt piles are found in the road. After this, the road forks in half until coming across a bridge, which opens to a large mud-filled turn that leads to the first checkpoint of the race. On the start of the second section, the player is led into a cave with several pits and trick ramps. After exiting the cave, the road will curve along a cliff side. After a boost panel the road turns to the right and the player will cross another bridge. At the next turn there is another trick ramp and the second checkpoint. The third section begins with a right turn on the side of a cliff. At this point, there is a straight path where rocks will fall onto the center of the narrow track. After the rock section, the road slopes downhill to a trick ramp. After another left turn, a hang gliding section begins. Once this begins the road will fork again. The left gliding route has an intermediate stop at a platform suspended by balloons with a boost pad, while the right side has a ramp and is located at a much lower altitude. After the hang gliding section, the player will land back on the beach, directly behind where they began the race. After a short path with a couple sand piles the player can do tricks on, the race ends. Maka Wuhu has two shortcuts. The first one is a hidden path in the lake in front of Summerstone Castle near the end of the second section, while the second one is through Summerstone Castle. The course also has a rather infamous glitch shortcut that can save at least 20 seconds, activated by jumping into the water on the right of the entrance to the cave or right next to the water, right after the second section begins, and Lakitu puts the player above the cave at the bottom of the hill before the third section begins. As of version 1.1, the glitch has been removed from Online Multiplayer, but it still works in the Single Player and Local Multiplayer modes. This page was last edited on April 17, 2019, at 10:02.